In the 1920s, the pharmacy founded on 21 October 1888 by Julius Meister already catered for photographers’ needs and sold various camera models and an appropriately expanded range of photographic products. It is thanks to the enthusiasm and the vision of Claus-Peter Meister that the LEICA brand played a particularly prominent role in the product portfolio. The strategy he implemented in the 1970s placed an intense focus on quality, exclusiveness and, of course, service. It could be said that he anticipated today’s ‘Leica Boutique’ concept in his concentration on the ideal presentation of a single brand. His extensive stocks were able to deliver everything that Leica could supply at a moments notice. This principle still characterises the philosophy of the ‘Meister’ enterprise and makes the company the most competent Leica address within the borders of Germany and beyond – a true story of success. Martin Meister carries on the vision his father made reality until today and, in 2001, opened a separate Leica Store in Hamburg-Eppendorf, one of the city’s most popular and prestigious addresses. 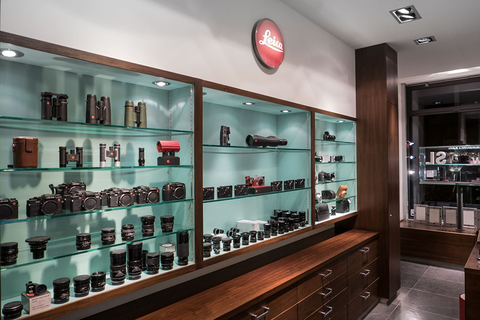 There, at 64 Eppendorfer-Landstrasse, newcomers to Leica and seasoned fans of the brand alike find everything to fulfil their heart’s desires. The dark beech of the wall cabinets and counters and the premium leather upholstery stand in contrast to the strong glass of the display shelves against celeste-coloured rear walls of the cabinets. The natural slate tiles of the floor create an atmosphere that is uniquely different from the shopfitting concept prescribed by Leica in Solms and Wetzlar.